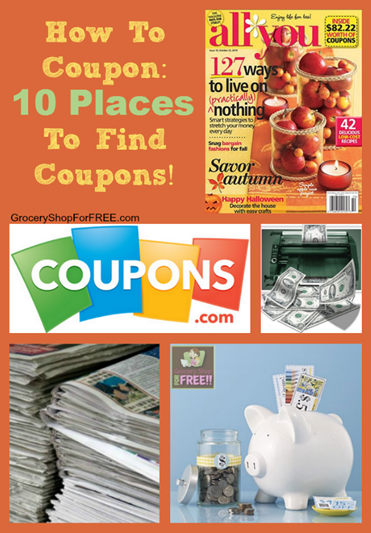 You are here: Home / Finance / Couponing / How To Coupon: 10 Places To Find Coupons! This is the first post in the series How To Coupon! Here we are going to talk about the Top 10 Places To Find Coupons, we can’t really shop with them until we have them! I want to make a couple of points first. You may see coupons sometimes and think you don’t use that product, so, you won’t keep that coupon. Well, in later posts we’ll talk more about why you need them anyway. But, for now, think about coupons as cash – you wouldn’t throw money away. Coupons ARE just like cash – the manufacturer is giving you $0.50 or $1 to buy their product, so that’s $0.50 or $1 less that you have to give the cashier! There are times and stores that will give you cash back after your purchase with a coupon, so, even though you might not want that product or use it, if you’re going to get money back and it’s FREE, why not buy it and give it to your local shelter? Again, we’ll talk more about all of that later. Almost every week you will find flyers full of coupons in the paper. we call them Coupon Inserts. There can be 1 – 6 a week in the paper. The main 3 are Smart Source, Red Plum, and P&G (Proctor & Gamble), sometimes there will be a General Mills, or Unilever, or similar inserts. There are lots of places online to print coupons. Normally you’ll just need to download software from the site and then you are able to print their coupons. At the top of this page you’ll see “Print Coupons” on the menu bar, when you hover over that you will see many places to print coupons. I know we all would just rather throw the junk mail away than open it, but, often there are high value coupons inside and you don’t want to miss out. So, open and check for coupons and THEN you can trash it. Same as with Junk Mail – you can often find coupons in your email, so before you delete emails from companies, make sure to check them for coupons you can print. Many companies have an email newsletter, those often have coupons in them. So, go to your favorite products sites and sign up for their newsletter and look around on the site for coupons. Also, you can email them and tell them how much you love their product or even give them feedback on how they can improve their product and they will send you coupons in appreciation. I once got 3 FREE packages of diapers for giving an honest opinion on the diapers I had purchased from a particular company! Ask your friends and family to save the coupons from the paper for you, if they don’t use them. Many people have a subscription to the Sunday paper or buy one each week and throw it out when they finish reading it. So, ask them to keep them for you. You can put a FREE ad up on Craigslist and ask if people are willing to save their coupons from the paper for you. I did that for someone once and she was able to get a nice little stash of coupons going! There are websites that sell full inserts each week, and even 10 – 20 of the same coupon, so you can get more than 1 product at a time. Look thru magazines and you might be surprised to find high value coupons inside. Many companies have a Facebook page and they often share high value and even FREE product coupons. So, you’ll want to follow any company that manufactures a product you purchase, chances are you’ll get some good deals throughout the year. So, right now your job is to collect coupons. In the next section, we’ll discuss how to organize them. Hopefully you’ll wind up with so many you will be begging for an organization method! It does help for sure! Are clipping services expensive? Do you know the going rate? No not really and on eBay you can choose. I would suggest finding one with FREE shipping and one cose to you so that the coupons are delivered in a timely manner. Also, if you are using eBay make sure to buy from PowerSellers, they have the best reputations. Dollar Tree doesn’t have Dollar Tree specific coupons, they take Manufacturer coupons. Where did you print those from?